In the light of our recent new enclosure project, volunteers please raise your hands! Your stay would involve helping Simon build parts of the 5 enclosures, prepare and feed the dingoes their dinner, and many more routinely duties. And don't worry, you'll receive a thank you lick at the end of each day from one of the kids. Due to the remote location of the sanctuary, expect a volunteer trip to be no less than 3 days. Accomodation kindly provided, but please bring your own food. To find out more how you can volunteer, send us an e-mail on the contact page. If you would like to support the sanctuary, why not virtually adopt one of the dingoes? Adoptions cost $50 per dingo per year, and will go towards food and enclosure upkeep costs. 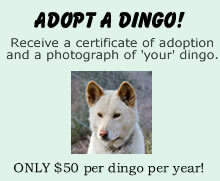 In return you will receive a certificate of adoption and an 8" x 10" photograph of your adopted dingo. Additionally, you are welcome to come and visit your chosen dingo by appointment at the sanctuary. Please go to Our Family and choose the dingo you wish to adopt after looking at their page(s). 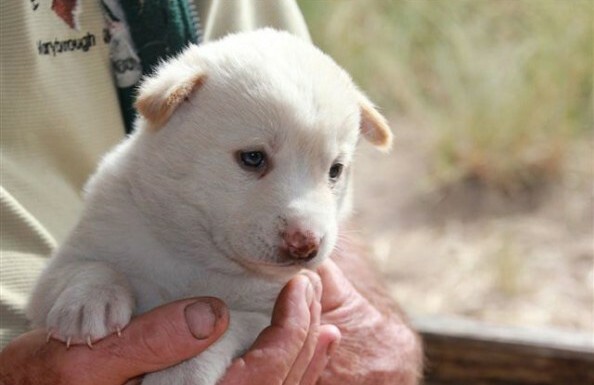 Adoptions can be made from the bottom of any page on this website by typing in the name of the dingo you wish to adopt and clicking on the 'Adopt a dingo' button. Payment is through PayPal using the safest and most trusted online payment system available. The dingo is listed as 'vulnerable' and is considered to be facing a high risk of extinction in the wild. The fate of the conservation of dingoes depends on public support. By working together we intend to ensure the survival of this iconic species and re-establish the natural balance. Simon is a passionate, hard working man and would deeply appreciate your support. We can make a real difference together. Donations can be made in any amount in either of two ways. Method One: Use the 'Donate' button at the bottom of any page to donate via PayPal. Method Two: Make a donation by Direct Deposit. The information is below the 'Direct Deposit' image at the bottom of every page. This method is available in Australia only. All donations and adoption fees go directly to the Durong Dingo Sanctuary for the care of the dingoes and the upkeep of the enclosures. No administration or other fees are paid from the Sanctuary account. If you would like to make a donation to our wishlist, Simon and the dingoes will be most grateful for your generosity. Please contact Simon to let us know what you can donate from our list below. Updates on items received from our Wishlist are always displayed on our Facebook page.